In your HubSpot account, navigate to your contacts, companies, deals, or tickets. Click the name of the record. Enter a title for your meeting. Click Select meeting type to select the meeting type. This setting is available only if you have enabled customized call and meeting types. Click the Attendees dropdown menu to search and select other contacts who should be included in the meeting. Set the start date and time of your meeting. Click Duration to set the length of your meeting. Enter a description for your meeting. Click the video icon insertVideo to insert a video conference link to your meeting. Click the Associated with dropdown menu to search and select the records to be associated with the meeting, or deselect any records that should not be associated with the meeting. Select Add to Google Calendar or Add to Office 365 Calendar to add the event to your Google Calendar or Office 365 Calendar and send the contact an invite. 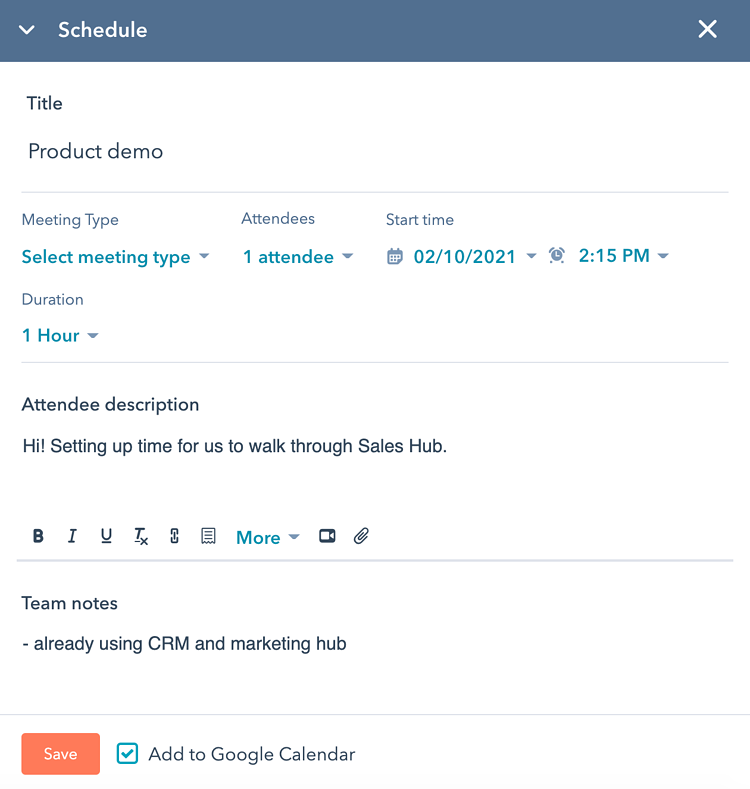 Learn more about connecting your Google Calendar or Office 365 Calendar to the CRM. If Add to Google Calendar or Add to Office 365 Calendar is selected, click Save. The contact needs to have a valid email address populated in the Email property in order to receive an invitation. Once the meeting is scheduled, your contact will receive an invitation with an .ics file which can be added to their calendar. An accepted meeting will automatically be created for you in your calendar. If you do not have Add to Google Calendar or Add to Office 365 Calendar selected, no meeting invitation will be sent. Please note: if you have not integrated with Google Calendar or Office 365 Calendar, you will be prompted to do so when scheduling a meeting.